You can now become a Facebook fan of Funky Dory Party Bags by clicking here. Keep up to date with latest product news, announcements or simply spread the word amongst your friends. You've got little Johnny's birthday party looming. You've decided on the theme, the venue, the food and games (more or less), you're almost ready to give out the invitations..........it's all plain sailing from now on. Have you invited the whole class, or just a select few? Have you forgotten to invite somebody whose party you went to last month? Will the parents want to stay? Will siblings want to tag along and create a fuss if dragged away by their ankles? If you're worried about the politics of birthday parties, then take a look at this article from the BBC for a few pointers! Children's Party Entertainment - how much? 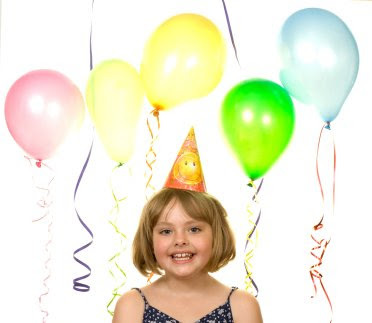 Every parent who hosts a child's birthday party is faced with the prospect of keeping a large group of kids happy for 2 hours. It's certainly one of the main questions that arises in parenting forums, and can cause some worry, but can you put a price on keeping the kids happy for 2 hours? According to this report by the BBC, parents pay anything up to £250.00 for an entertainer! That's not including the hall fee, the food, party bags etc. Of course, if you can afford it, there's nothing wrong with splashing out on your child's day to make it one they'll never forget, but in the current climate, many of us will be less able to splash the cash. We've found a growing trend for parents to go back to the way their parents did it when we were young. A few friends round for a tea party with traditional party games, lucky dip presents and a party bag at the end of it. If you have a garden, and the weather is good, it's sometimes the best (and cheapest!) solution. Alternatively, your local village hall or community centre may have surprising cheap rates. But how do you entertain the kids? Easy - get a couple of willing adult helpers, a craft activity, a few games (pass the parcel, musical statues, pin the tail on the donkey), followed by tea, some time to run around the garden, and end it all with a treasure hunt. 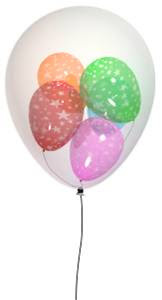 You'll find many party games and buffet food ideas at Funky Dory Party Bags. Of course, no party is complete without a little take-home treat, and you really don't have to pay several pounds per party bag - our most affordable filled party bags are under £1.50 each, and full of good quality, lasting fillers that will not end up in the bin as soon as you get home. We have some fab new filled activity party bags in stock. In a range of themes, these filled party bags contain a bumper sticker activity book, pack of crayons or pencils and a toy. They are great for keeping children busy during parties and events such as weddings (try teaming them up with our personalised luxury party bags), and will last long after the party or event is over. 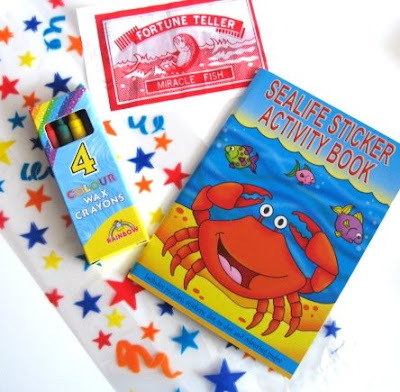 The Sealife Sticker activity Filled Party Bag contains a sealife themed sticker activity book, pack of crayons or pencils and fortune telling fish. The Dinosaur Sticker activity Filled Party Bag contains a dinosaur themed sticker activity book, pack of crayons or pencils and stretchy lizard. The Alien Sticker Activity Filled Party Bag contains a space alien themed sticker activity book, pack of crayons or pencils and stretchy alien. The Spooky Sticker Activity Filled Party Bag contains a spooky themed sticker activity book, pack of crayons or pencils and a finger monster. Prices start at £1.15 each plus the cost of your party bag, so as always, they are great value for money as being really useful. With the schools breaking up for the summer holidays in a few weeks' time, we'll all be hoping for lots of nice weather! I've just added some fun summer party products, ideal for handing out to the kids during summer garden parties, family barbeques, or just for giving to the kids to play with on a sunny day. We have things that you chuck, squirt, and things that fly. We especially like the foam rocket, and the animal water pistols! Of course, no summer fun day would be complete without a water bomb or two. These products are all great fillers for party bags and great value for money. You can see them all in our summer party bag fillers section. Due to unforeseen circumstances, Personalised Party has moved to its very own section on Funky Dory Party Bags. This means we have all our fantastic products on one website. 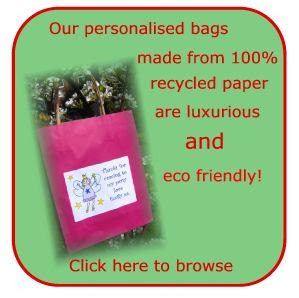 So whether you are after a few empty party bags, filled party bags or something really special like a recycled luxury personalised party bags, or personalised chocolate, you can find them on the same site. Bored of the usual pirates, princesses, football and superhero party themes? Why not try a lego themed party? It's not as daft as it sounds. Those people at Lego have come up with some really simple party ideas - including party activities and games, and even instructions on how to make a lego cake. The beauty of this theme is that it is suitable for all ages, in particular, toddlers and pre-schoolers who enjoy playing with lego duplo. 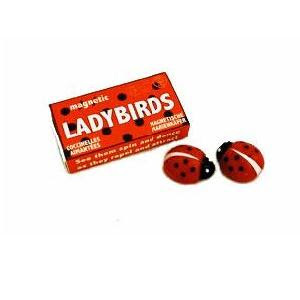 Magnetic Ladybirds back in stock! Our ever popular magnetic ladybirds are back in stock. Great fun for kids over the age of 3, watch them dance around as the magnets attract and repel each other. These magnetic toys (and the equally appealing magnetic frogs) make really charming party bag fillers, especially for summer parties and family BBQ's. Team them up also with our miniature ladybirds and miniature frogs for a real backyard safari in your party bag!